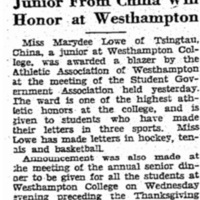 Article "Junior From China Win Honor at Westhampton"
This article talks about Marydee Lowe, a junior of Westhampton College from Tsingtau, China, and how she was honored by the Athletic Association of Westhampton for her many achievements in sports. She was awarded with her blazer for making her letters in hockey, tennis, and basketball. 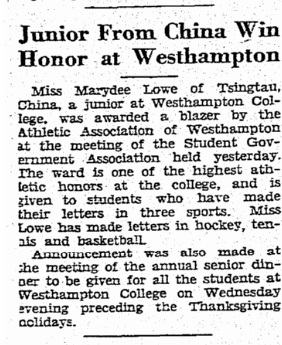 The award was one of the highest athletic honors at the college. “Article "Junior From China Win Honor at Westhampton",” Race & Racism at the University of Richmond, accessed April 18, 2019, https://memory.richmond.edu/items/show/510.